Wet cool and very windy best describes today here at Stocks. Bank anglers have said it was hard to cast with the strong westerly wind blowing straight down the res and as a result, boat anglers have had more success overall. Still some good results from both areas…..
A handful of anglers saw 2 fish a piece from in and around Hollins and out towards bell point as well as up at the Dam Wall. Mr P. Blight had 6 fish today from the Dam Wall. He caught all of them using dries, a sedge fly in particular. Peter Kosminski had 9 fish today from Bell Point and in Hollins Bay. Peter caught using a booby and his 5 fish bag weighed 10lb 12oz. Well done. John Mitchell had 3 fish today using a bibio hopper and a brown hopper. Nigel Williams had 6 fish to the boat today. His 3 fish bag weighed 7lb. Wayne and Mark Knowles had 8 fish to their boat today with 5 falling to Mark and the other 3 to Wayne. Marks bag weighed 9lb 12oz and Waynes weighed 6lb. They caught in the N Shallows on daddies. Derek Moore had 8 fish to his boat. Derek caught at the Dam, Eakings Flats and Hollins Bay using dries, stripping blobs and a cats whisker too. Well in Derek, glad to hear you were getting them chasing blobs when other tactics weren’t so fruitful! Stuart Llewellyn was top rod today with 15 fish to the boat. Stuart caught off Hollins Point and up at the Dam using daddies and cats whiskers with roughly 8 fish a piece to each fly. His best fish was a 4lb 8oz blue. Nice angling Stuart! This entry was posted in Stocks Reservoir Fishing Reports on June 30, 2013 by Ben Dobson. NOTABLE CATCH: 20+ fish for Steve Smalley. NOTABLE BAG 5 fish weighing 11lb 12oz for David and Ben Teague. BEST RAINBOW: 4lb for Nathan Merritt. BEST BROWN: 2lb 12oz for David Teague. BEST BLUE: 2lb 12oz for Ben Teague. BOAT ROD AV: 7.66 fish per angler. SPORT: Good fishing conditions this morning with plenty of cloud cover, it was only this afternoon when the rain arrived but this did not seem to affect the sport. Lone bank angler Ray Mercer had 4 fish, unfortunately i don’t know how or where he caught them. Jimmy Brown was out on a boat today with daughter Louise and grandson Nathan with both young anglers landing 3 fish each including a super 4lb rainbow for Nathan. They caught in the northern shallows and off Hollins point with both daddies and boobies taking fish. 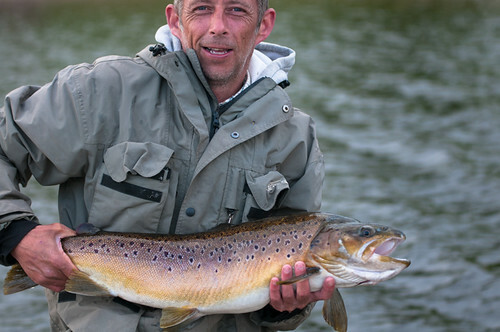 Steve Smalley had an excellent days fishing landing over 20 good rainbows and blues. Steve fished around Eaking shallows and willow island where he put his dry flies to good use. Also out on a boat were father and son team David and Ben Teague who caught 9 fish between them. They found their best fly to be a daddy long legs and although they caught fish up by the dam their best spot was at the side of the jetty and 2 trees. Syotw. This entry was posted in Stocks Reservoir Fishing Reports on June 27, 2013 by Ben Dobson. We have some cracking rainbows over the last couple of weeks, two of the best were caught by Steffan Spiwak and Mr P Wolley. Mr Wolley caught his big rainbow on a minkie, a fly that has accounted for many fish over the last month or so probably due to the high population of sticklebacks present in Bank House. He fished it back with a jerky action, which proved too tempting for a 13lb 8oz rainbow. I know that there has been other double figure rainbows caught over the last couple of weeks but the anglers have not completed the returns book, so if you visit us please take a minute at the end of the day to record your catches. There are some huge brownies in Bank House at the moment. We have recently seen the fishery record broken by Ben Mason with a fish of 19lbs 8oz, but there are others at large. I’m sorry to report one or two ducklings have been seen to meet their fate at the jaws of our big brownies. There’s a challenge for you fly tyers! David Harrison landed a huge brownie that bottomed his scales out at 15lbs, he conservatively estimated it at 15lbs 8oz before returning it to fight another day. David caught this monster on a white beaded buzzer. Mr D Morgan from Haydock had another at 13lbs that was tempted to an olive zonker whilst he was fishing off the main Island and Mike Fletcher from Stafford landed a 12lb brownie, which took a sedge pulled across the surface. Mike also caught a lovely Tiger trout of 3lbs. The best tiger recorded was a fish of 5lbs caught by Andrew Brigg from Much Hoole. Andrew caught it a daddy long legs. Dries are generally a good way to get Tigers as they sit on the bottom looking up so they can always see a large area of the surface. There may have other big tigers caught there are some in that must be approaching double figures! Unfortunately i missed the ‘Best Tiger’ column off in the return book so some may have be unreported. There have been lots of blues caught between 3 and 5lbs but nothing bigger. Mr S Ellison caught the best at exactly 5lbs on a black mini lure but Dave Dawson, Bill Latham, Eric Smith, Stefan Spwack and S Smythers all had blues of 4lbs or over. Brightly coloured lures often work well for the aggressive blue trout. Two anglers caught 12 trout the first was Alan Wilkinson from Barrow in Furness who fished both white lures and buzzers along Bridlebank and the second was Barry Garner who fished size 14 black hoppers dry. Barry kept on the move and fished his way right around the lake. This is a tactic that often pays at Bank House. Ricky Newbolt also had a cracking half day with 11 fish on small buzzers and dries. There have been loads of alder flies and sedges about and I think they will only increase in numbers through the early part of July. Buzzers will also play a big part; red buzzers in particular seem to have been scoring well so they may well continue to feature into July. The best lures will probably be Minkies and Cats Whiskers although Hot Headed damsels can a brilliant summer lure pattern. If you are thinking of visiting us in an evening (which I can highly recommend) small dries such as hoppers, cochy bondu and F Flies all score really well in the fading light. NOTABLE BAG 5 fish weighing 23lbs for Phil Davies . BEST BLUE: 9lb for Phil Davies. BANK ROD AV: 4.2 fish per angler. BOAT ROD AV: 6.2 fish per angler. A quick congratulations to youngster and first time fly fisher Andrew Fleming for catching his first fish on a fly rod, a lovely 2lb 4oz blue trout taken on a fritz. Well done Andrew. Mick Whiteside caught 7 fish today on a half day ticket. Mick used an orange fish and his best fish was a 3lb 8oz rainbow. Nice angling. Phil Davies had another good day up at the dam and on the east bank catching 10 fish in total with his 5 fish bag weighing a whopping 23lb thanks to a lovely 9lb blue. He caught on buzzers all day. Well done Phil. Mr E Parson had a great half day out there from Barn Quarry. He caught 10 fish on a 2 fish ticket and one of his 2 fish was a 10lb 70z rainbow. He caught using a dawsons olive. Well done bud thats a good result. Ken Whiteside was top rod from the bank today on his half day sporting ticket. He had 13 fish using a UDF (I think thats what it says) from Hartleys and Bell Point. Good angling Ken! Ralph Cooper did well catching 5 fish from the boat today. He used various lures and his best fish was a 3lb rainbow tipping his 5 fish bag to 11lb. He caught all over the reservoir. Paul Bebb and Chris Biddle were out today and they caught 9 fish using various dries again all over the reservoir. They also missed and lost a lot of others. Thats how it goes as we all know but well done for the fish had! Keith Charnock was the top roid from the boat today managing 15 fish in total. Keith fished around willow island and newclose bay and saw action using diawl bachs and buzzers. His 5 fish bag weighed 13lb 8oz. Good effort ! This entry was posted in Stocks Reservoir Fishing Reports on June 26, 2013 by Ben Dobson. NOTABLE CATCH:	5 trout for Keith Landless. BEST RAINBOW:	Several weighing 3lb. BEST BROWN:	1lb wild brownie for Ron Daniels. BEST BLUE:	3lb 8oz for Andy Galbraith. BANK ROD AV:	1.75 fish per angler. BOAT ROD AV:	2.00 fish per angler. SPORT: This morning started with plenty of cloud cover but this changed and by lunch time the sun was shining making things tricky, a nice day to be out but not ideal for fishing. On the bank today was Keith Landless who caught 5 fish from barn quarry. Keith caught all his fish on a buzzer. Out on a boat was David McCabe who caught 4 fish. David caught his fish on a daddy long legs and a black gnat whilst drifting from Newclose bay to Gull island. A few anglers said they saw rising fish but were unable to catch them, sometimes when trout get preoccupied on tiny flies it can be better to cast a booby at them and rip it back rather than try to emulate what they are actually feeding on. Syotw. This entry was posted in Stocks Reservoir Fishing Reports on June 25, 2013 by Ben Dobson.